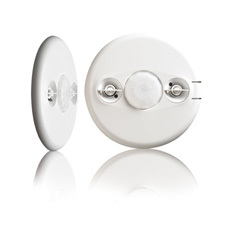 The current trend in occupancy sensors is to pack more features and options in ever smaller packages, making sensor installation quick and efficient, while also promoting the greater use of sensors for both energy savings and security benefits. First, sensors are moving towards a lower-profile, cleaner design intended to “flatten” the device against a ceiling or wall. Full room, 360-degree coverage is another trend, with multiple sensors perhaps used in larger spaces or zones that overlap. New sensors from WattStopper also utilize the company’s SmartSet technology, meaning no adjustments are needed at time of installation. The devices monitor usage patterns in a room or area and then adjust time delays and settings to maximize energy efficiency and optimize performance. Another new feature is called “walk-through mode” in which a SmartSet-equipped sensor will turn lights off three minutes after an area is initially occupied if it does not detect movement within 30 seconds. That is, the lights don’t stay on for fifteen minutes or half an hour if someone is simply dropping off mail or picking up a set of keys left on a desk. Other features include quick, plug-in terminal wiring to make installation and device relocation faster and easier. WattStopper offers both low and line voltage options to allow for installer preference based on existing room wiring. Advanced ultrasonic diffusers evenly distribute ultrasound in order to cover a controlled area more comprehensively, and a one-touch built-in light level sensor is included, as is the opportunity to operate the sensors manually — wiring to a wall-switch can be done easily and affordably. The company’s latest passive infrared (PIR) ceiling mount sensors now have enhanced occupant sensing technology such as detection signature analysis and pulse count processing. Finally, WattStopper also now offers Dual Technology sensors, combining both PIR and ultrasonic sensor technology in one device. Using what it refers to as the Dual Sensing Verification Principle, such devices are programmed so that both technologies must detect occupancy to turn lighting on, while continued detection by only one technology will hold the lighting on.